While working in Liberal Kansas I spotted this beauty. I cannot figure out how to include mor than one photo per post on Tapatalk . I like the old steam wrecker crane. The sloped roof on the "doghouse" on the crane tender flat car is a clever idea as well. In the second photo, I see what looks like a heavy steam or air hose hanging off a valve sticking out just below the roof line of the "house". My guess is this old crane was being run on compressed air rather than having its boiler fired up. Or, the hose provides compressed air for running the "blower" (induced draft nozzle) when firing up with a cold and dead boiler. I would also say that the crane may well have been used as a wrecker, since it has (in the first photo) a "dynamo" ( small steam turbo generator used on steam locomotives to make power for lights) up on the roof of the house, and there is a large light fitted below the boom. Either the crane had to work on railroad construction jobs after dark, or was sent out on wrecking jobs which would require working at any hour of the day or night and in any weather. The Rock Island probably ordered this crane with a coal fired boiler, given their operating territory. However, towards the end of its use by the Rock Island, it may well have been converted to oil firing. Steam wrecking cranes hung on a good while into the dieselized era and were probably the last steam powered equipment on many railroad's rosters. Once the railroads had dieselized, the coal tipples and ash pits were taken out of service, but there was plenty of diesel fuel oil. As cleaned-up and well painted as this crane is, along with the Rock Island name on it, the only place this crane could survive would be a museum or tourist railroad. The Rock Island Line is one of what are known as "fallen flags"- the railroad companies which went out of existence in around the 1960's-70's. It is good to see this old steam crane looking well cared for- at least externally. With paint on the turntable and rollers (unless it is heavy open gear lube), the crane looks like it is more of a static display than a working piece of equipment. Regardless of whether it sits static or is run on compressed air now and then, it is good that this old crane escaped the razor blades. When people were looking to preserve historic railroad equipment, they tended to focus on locomotives and rolling stock- fancy passenger cars and some freight cars and cabooses. 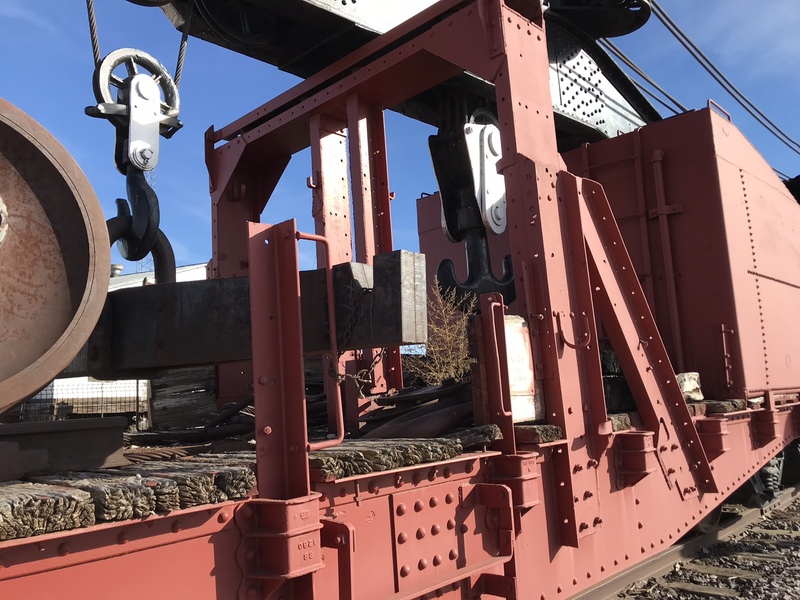 I suspect that steam wrecking cranes were nearly off the radar of most preservation groups and the result is the bulk of the steam wrecking cranes (big hooks) passed unnoticed to the scrappers. There are some links to videos of a working steam crane in in this thread. Let me know if there is any thing else you would like to see, I will be working in Liberal next week. Thanks for the kind offer to take further pictures of the railroad wrecker crane. I imagine it is secured against entry, and taking pictures in the close confines of the crane's house would not work out too well. From the photo you posted in your second post on this thread, it looks like the auxiliary block is hooked to a picking beam made for lifting railroad car frames or car bodies. Looking at the way the pedestal for landing the boom on is built and other details, it looks like this crane was in service well into fairly recent times. 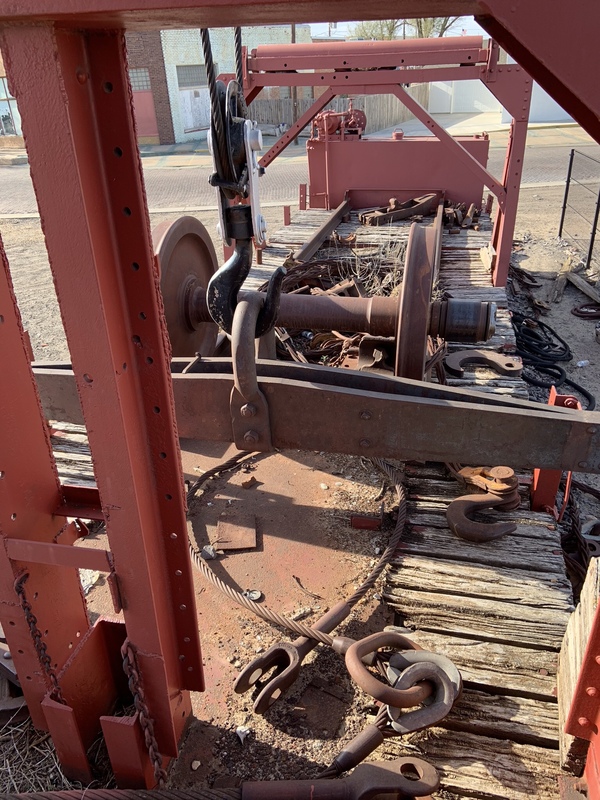 It looks like the pedestal for landing the boom on was built out of whatever steel the shops had left over from other railroad equipment or structures they might have had in their boneyard. From the degree of rotting on the car deck planks, it would seem that this crane and its tender car have been sitting for quite a few years as a static display. The phrase: "Quietly sleeping in the sun" comes to mind in looking at your photos of this crane. The beauty of a lot of the old steam equipment is its simplicity and inherent ruggedness- or forgiveness might be a better term for the engines and machinery. No forgiveness in the boiler, though. 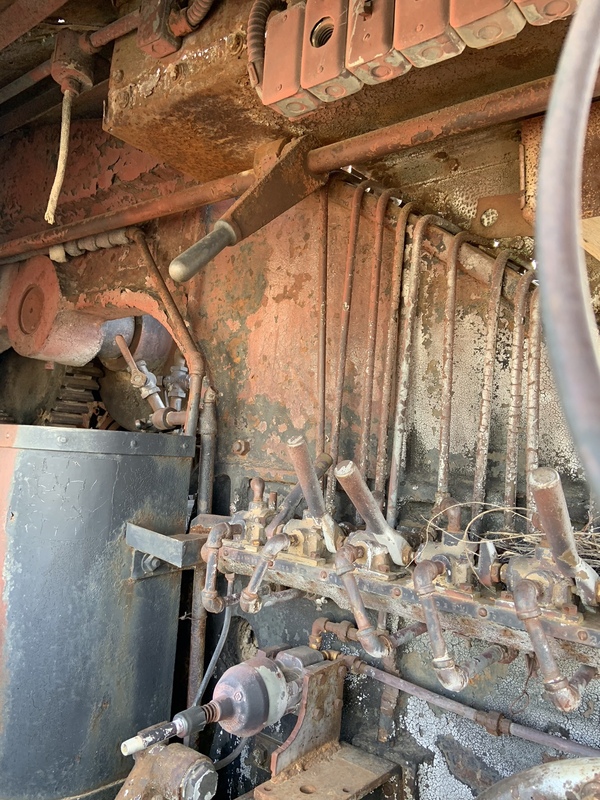 We've touched on the issues surrounding pressure vessels of different types on this 'board, and one member has related a story of how the boiler on a locomotive crane his father owned had failed, killing the crane operator. 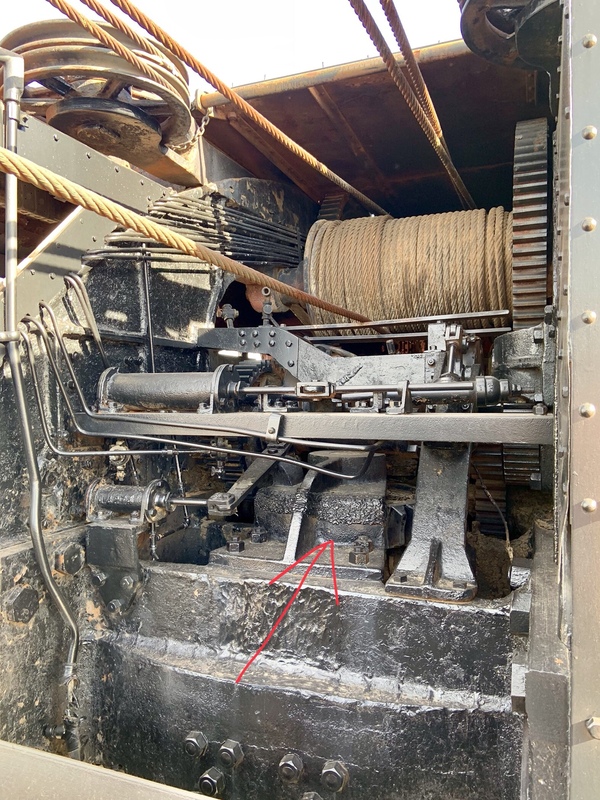 On a lot of the old steam cranes, as the boilers passed the point of no return, no practical repair being possible, they were run on compressed air. With the advent of rotary screw air compressors, getting a compressor with enough displacement to run a steam crane became more practical. Of course, when a steam crane had reached that point, it was unlikely that the owner/operators were going to put much money into it. As a result, the loose fits and loose clearances eventually would spell the end of the steam cranes. While steam tended to seal and make up for loose fits of pistons in their cylinders and similarly sloppy fits on slide or piston valves, compressed air would not. The result was a steam crane that ran on steam despite a lot of wear on the pistons, cylinders, valves and similar would often not run as well on air, and sometimes not at all. This was the end for most of the steam cranes, and they were often scrapped at that point. This old steam wrecker is definitely a survivor. Whether she is run on compressed air from time to time, or simply just sits out in the sun with windblown brush accumulating on the bed of her tender car, she is hopefully going to sit intact for many years to come. I will try to get some photos of inside. Door is locked, but no fence or anything around it. 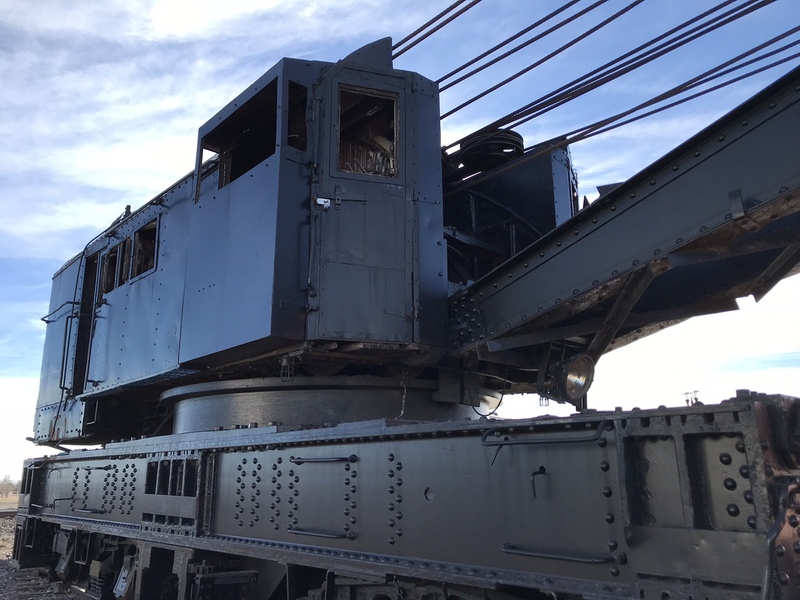 The wrecker at Liberal, Kansas is a Type X 160-ton crane... first developed in 1915 by Industrial Works, Bay City, Michigan. This particular “Big Hook” represented an increase in capacity from the previously offered Type VA crane which was rated at 150 ton lifting capacity. Construction/Serial number on the crane shown is 4605 and was built in 1925 for the Chicago, Rock Island and Pacific Railroad. Sometime around 1980 the wrecker was retired. Looks like it's in great shape! The steam crane at Greenfield Village still operates, using compressed air and a locomotive coupled to it. It is a low profile crane that was built for service in a rail tunnel under the Detroit River. I think they said it had never been needed in the tunnel. There are videos of it being demonstrated. 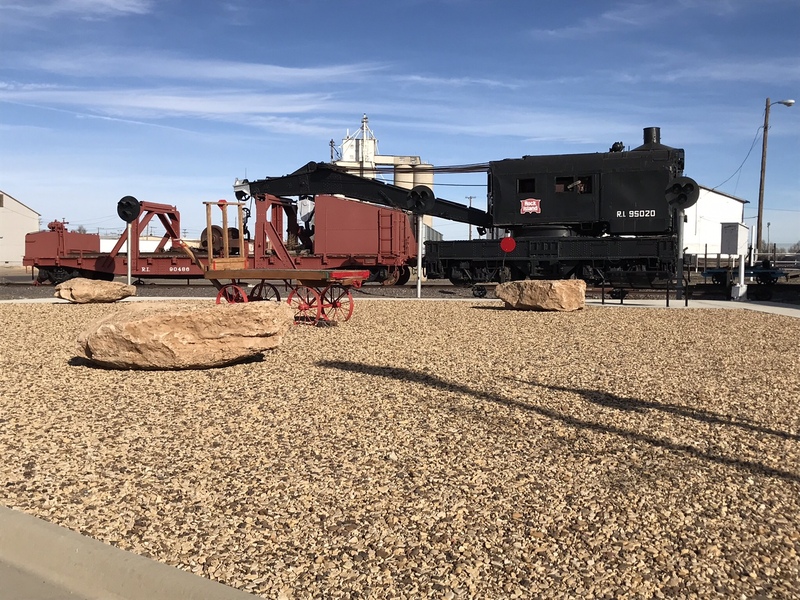 There is also an operating railroad steam wrecker in Ely Nevada at the Nevada Northern RR. the steam it up on occasion. Lots of videos on Youtube. I lived in Ely for 6 months and it was refreshing to see the amount of remaining RR history there. My then home-town of Yoakum, TX used to be the hub-city for the SA&AP railroads, and nothing survives today but a big undeveloped corridor through town and a few buildings that were re-purposed. Supposedly, one of their old steam engines survives at the Granite Mountain theme park in Georgia, and was recently pulled out of active use. It'd be cool if someone found a way to send it home. My art teacher in High School told us when he was a kid, the SA&AP passenger depot was still standing, but had tree's growing through it and he remembered the day they knocked it down. The foundation is still there though. I read somewhere that it was one of the most beautiful passenger depots of it's size west of the Mississippi. The patch of land that had the round-house and the bulk of other structures is still vacant and covered with brush as the dirt is too contaminated to pass any environmental tests. A few years ago the town made the effort to turn a big chunk of corridor that split the town in half into a park. They recreated a fence that runs long side of it from photos, but otherwise it's just a grass patch. I was back in Liberal today, after I was done crawling all over crane taking photos I seen the sign “no climbing on crane”. But I didn’t get caught. Photo of draw works note the red arrow I added, slew gear had been broken and welded. It is interesting that this wrecker has air operated brakes and clutches. The two railroad steam wreckers that I am more familiar with (not from an operating standpoint mind you) have no such luxury. 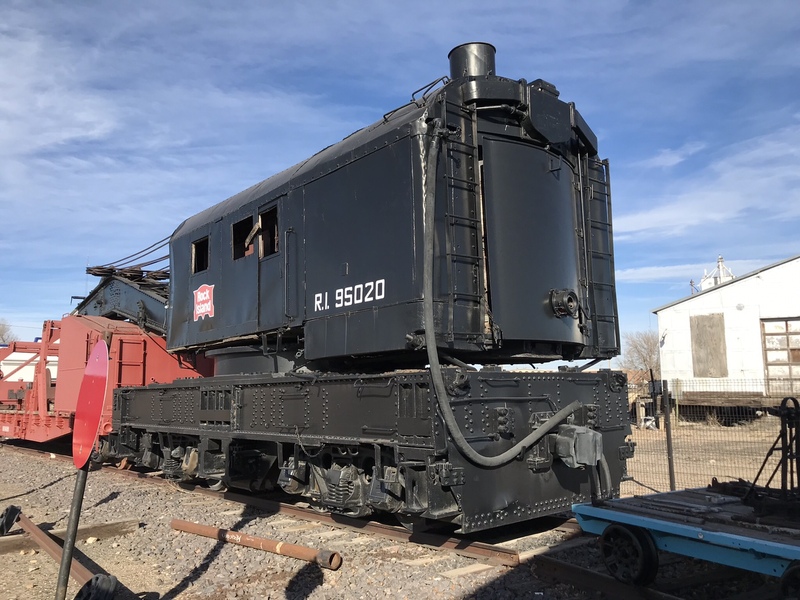 The RR museum where I volunteer has two such cranes, one from the Santa Fe (minus boiler and some machinery), and one from the Southern Pacific (mf'd by Industrial Brownhoist circa 1910). The SP wrecker was retired some time in the '70s and complete when donated. About 1987 a crew of us "steam heads" decided to undertake returning the SP wrecker to operation, sending the boiler out for retubing while we worked on the machinery. The two engine cylinders were lubed with ATF and turned over on "shop air". We got everything to move except the clutch for "swing" or "slew". No amount of heat or penetrant we tried would budge it. Unfortunately the crew moved on to higher priorities and the SP wrecker remains nonoperational. Somewhat related to this thread, here is a steam shovel at Roots in Ukiah, CA. I've watched it operate and it's pretty slick. When I watched it work, the operator had a dog that lounged underneath the counterweight..not at all bothered by the noise, steam or swinging of the machine..brave pooch.